Every year I make a homemade treat to give to friends and neighbors. 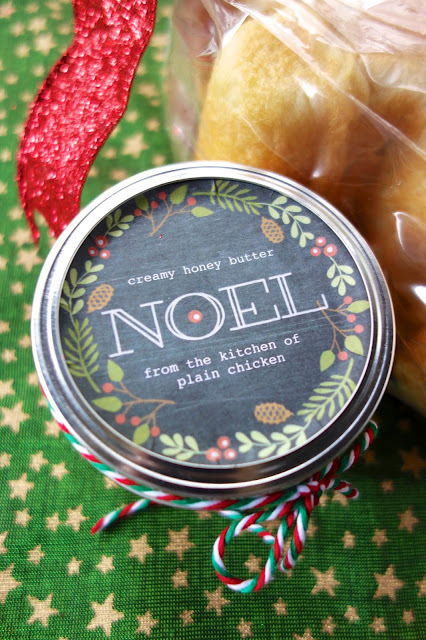 This year I am giving this Creamy Honey Butter and a loaf of homemade bread. I found this recipe on Pinterest. It didn't have a link to a website. 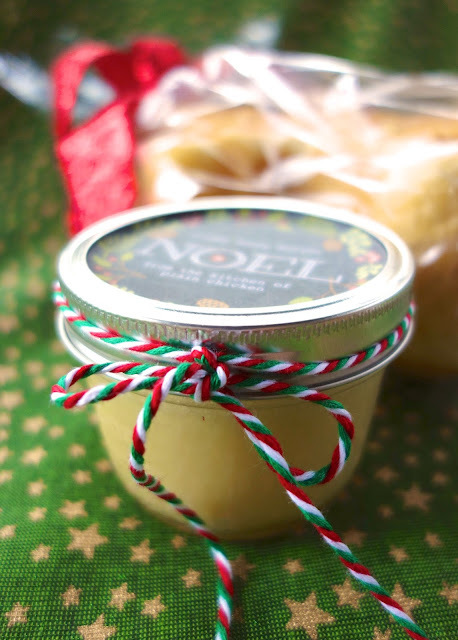 It was just a photo of a jar of this golden butter and the recipe. I gave it a try and it was great! I could seriously drink this stuff with a straw! The bread pan is from Williams-Sonoma. I got it last year. I love it! I used my Potato Sourdough Starter for the bread. I've had it for probably 15 years. It makes the best bread ever! If you are in Birmingham, let me know if you want some starter. I will be happy to meet you. The jars are from Amazon. I used the Kerr Half Pint Wide Mouth jars. The labels are from WordLabel. You can find them here. In a medium pan, combine honey, cream and sugar. Bring to a boil; continue to boil for 1 minute. Place butter in blender. Pour honey mixture over butter. Pulse until thoroughly blended. I'm so lucky I was a recipient of this...HEAVENLY! I've been making a recipe similar to this for years. The only difference: an extra stick of butter. We like a little more butter flavor, but I agree with you - this stuff is divine!!! I will try it with an extra stick of butter next time - thanks! I love this idea! I pinned and definitely want to make some!! Thanks Yvonne! This stuff is like crack!! This may be a dumb question but...unsalted butter or salted butter? My 15 yr. old tried it on biscuits!! This was a fabulous Gift!!! Awesomeness! 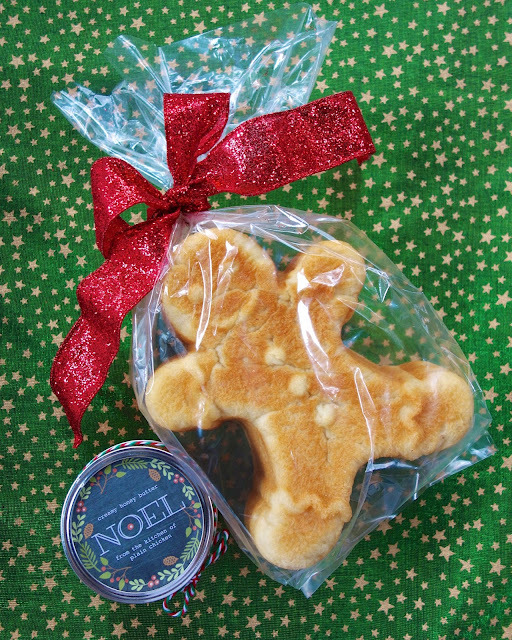 How did you make the bread in the shape of a gingerbread man? Thanks and I enjoy your blog. I have a gingerbread man pan that I baked the bread in. It was made by NordicWare. Email me & we can set up a meeting! This would make some people very happy when receiving it as a gift! Your bread recipe is the same one I use. I usually make three loaves of bread (8-in pans) from one recipe. Does this cute pan equal one 8-inch pan? That's the cutest thing I've ever seen. I'm ready to order the pan for next year! This sounds amazing! I'm making it right now. When you say makes "approx 6 cups", do you mean the recipe makes 6 half pint jars? Thank you for this recipe! Should you let the honey mixture cool down before adding to the butter? No - I poured it over the butter hot. Um, yeah, this is gone. Mark and the kids put it away last night - I only got one bite. They inhaled it! Would the starter travel well? I live in California, but I'll be visiting family in B'ham between Christmas and New Years...but I don't know if it would travel home with me well.